While dogs are prohibited on the event lawn, on-leash dogs are allowed in the "Middle Lawn," while off-leash dogs are restricted to a portion on the west end of the park. The area is under construction throughout 2014, financed via a donation from Austin concert promoters C3 Presents. A rendering of upcoming changes to Auditorium Shores. Parking meters are being added to the Butler Shores Ball Fields. The Parks and Recreation Department expects the six parking meters to cost a total of $60,000, which will be paid by the department over a five-year period. The parking meter rate is going to be $1 an hour, which should net the department an expected $16,000 annually. The council named nearly 100 free Google Fiber "Community Connections." The council approved recommending 99 public and nonprofit organizations for free access to Google Fiber. The much-anticipated high-speed internet service will include 23 public libraries. The one difference between the approved list and a preliminary list of 100 locations (which you can see mapped here): The Andy Roddick Foundation. (In what we're sure is pure coincidence, Roddick appears in a commercial for AT&T's new Fiber rival, U-verse with GigaPower.) The 99 organizations will be provided the free service through 2023. The City Council approved Project Connect’s plan to run a commuter rail to Highland Mall and along East Riverside. Read more about that here. Should Auditorium Shores Move the Off-Leash Area for Dogs? 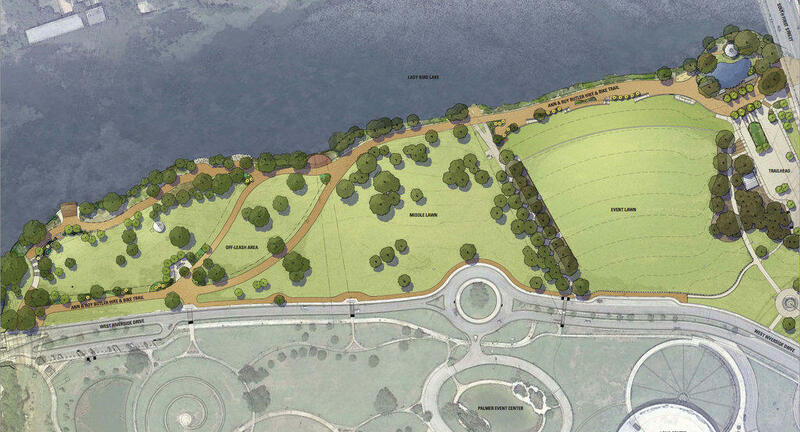 Update: A final public meeting on proposed changes to Auditorium Shores takes place tonight. And the plans have some dog lovers howling. With a $3.5 million donation, the city plans to realign the hike and bike trail, put in new turf grass and redesign the off-leash area for dogs – moving it along the shoreline and adding a series of “dog launches” into Lady Bird Lake, but shrinking it in the process.